I photographed this couple in the lobby of the Andaz Hotel in West Hollywood and I couldn't be more tickled with the result. 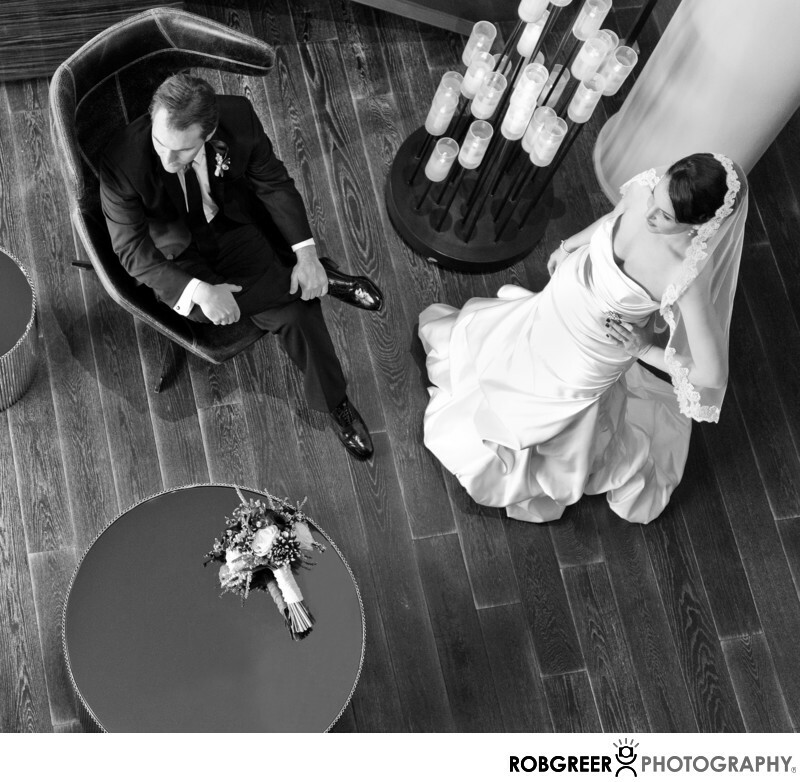 First of all, taking a wedding photo from an angle that is unexpected is a sure way to create a unique image that is likely to be loved by a bride and groom. If I recall, I first posed this couple and photographed them at ground level, and then ran up the stairs to photograph them from above taking in a completely different scene. Given the location of the Andaz Hotel, there are many locations that are nearby that are also suitable for wedding portraits, and so I spent most of our time photographing this couple and the wedding party on the first floor lobby, on the second floor balcony, and on the roof in the pool area. However, the roof photography was somewhat challenging as it was raining on and off that day and so I only had limited time available to me in between showers. Andaz Hotel is located in West Hollywood, California. Phone: (323) 656-1234. Website: https://www.hyatt.com/en-US/hotel/california/andaz-west-hollywood/laxss. Location: 8401 W Sunset Blvd, West Hollywood, CA 90069. Keywords: Andaz Hotel (6), West Hollywood (6). 1/60; f/2.8; ISO 2500; 48.0 mm.